The study which details their discovery, titled “Probing Planets in Extragalactic Galaxies Using Quasar Microlensing“, recently appeared in The Astrophysical Journal Letters. The study was conducted by Xinyu Dai and Eduardo Guerras, a postdoctoral researcher and professor from the Homer L. Dodge Department of Physics and Astronomy at the University of Oklahoma, respectively. For the sake of their study, the pair used the Gravitational Microlensing technique, which relies on the gravitational force of distant objects to bend and focus light coming from a star. As a planet passes in front of the star relative to the observer (i.e. makes a transit), the light dips measurably, which can then be used to determine the presence of a planet. In this respect, Gravitational Microlensing is a scaled-down version of Gravitational Lensing, where an intervening object (like a galaxy cluster) is used to focus light coming from a galaxy or other large object located beyond it. It also incorporates a key element of the highly-effective Transit Method, where stars are monitored for dips in brightness to indicate the presence of an exoplanet. In addition to this method, which is the only one capable of detecting extra-solar planets at truly great distances (on the order of billions of light years), the team also used data from NASA’s Chandra X-ray Observatory to study a distant quasar known as RX J1131–1231. Specifically, the team relied on the microlensing properties of the supermassive black hole (SMBH) located at the center of RX J1131–1231. They also relied on the OU Supercomputing Center for Education and Research to calculate the microlensing models they employed. From this, they observed line energy shifts that could only be explained by the presence of of about 2000 unbound planets between the quasar’s stars – which ranged from being as massive as the Moon to Jupiter – per main-sequence star. 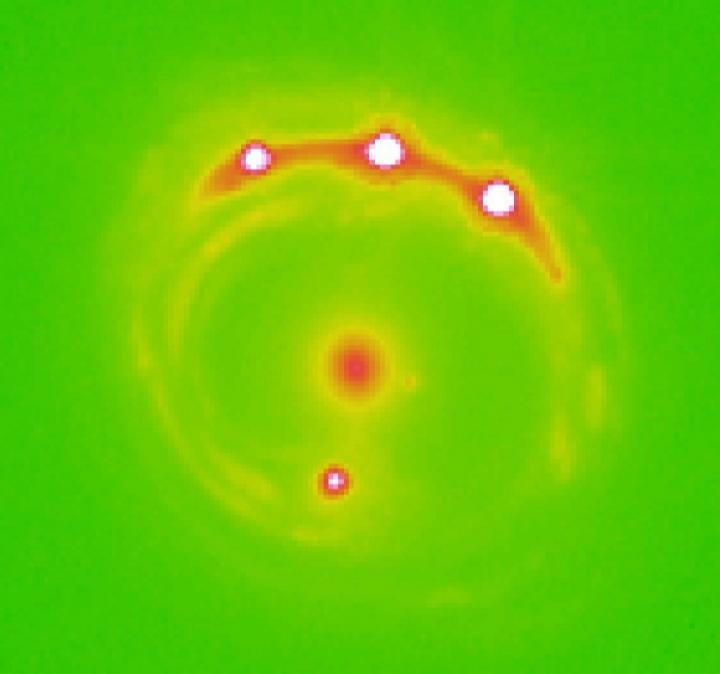 While 53 planets have been discovered within the Milky Way galaxy using the Microlensing technique, this is the first time that planets have been observed in other galaxies. Much like the first confirmed discovery of an extra-solar planet, scientists were not even certain planets existed in other galaxies prior to this study. This discovery has therefore brought the study of planets beyond our Solar System to a whole new level! In the coming years, more sophisticated observatories will be available, which will allow for even more in the way of discoveries. These include space-based instruments like the James Webb Space Telescope (which is scheduled to launch in Spring of 2019) and ground-based observatories like the ESO’s OverWhelmingly Large (OWL) Telescope, the Very Large Telescope (VLT), the Extremely Large Telescope (ELT), and the Colossus Telescope. At this juncture, the odds are good that some of these discoveries will be in neighboring galaxies. Perhaps then we can begin to determine just how common planets are in our Universe. At present, it is estimated that could be as many as 100 billion planets in the Milky Way Galaxy alone! But with an estimated 1 to 2 trillion galaxies in the Universe… well, you do the math! Back in November, a team of researchers from the Swinburne University of Technology and the University of Cambridge published some very interesting findings about a galaxy located about 8 billion light years away. Using the La Silla Observatory’s Very Large Telescope (VLT), they examined the light coming from the supermassive black hole (SMBH) at its center. In so doing, they were able to determine that the electromagnetic energy coming from this distant galaxy was the same as what we observe here in the Milky Way. This showed that a fundamental force of the Universe (electromagnetism) is constant over time. And on Monday, Dec. 4th, the ESO followed-up on this historic find by releasing the color spectrum readings of this distant galaxy – known as HE 0940-1050. To recap, most large galaxies in the Universe have SMBHs at their center. These huge black holes are known for consuming the matter that orbits all around them, expelling tremendous amounts of radio, microwave, infrared, optical, ultra-violet (UV), X-ray and gamma ray energy in the process. Because of this, they are some of the brightest objects in the known Universe, and are visible even from billions of light years away. Artist’s interpretation of ULAS J1120+0641, a very distant quasar. But because of their distance, the energy which they emit has to pass through the intergalactic medium, where it comes into contact with incredible amount of matter. While most of this consists of hydrogen and helium, there are trace amounts of other elements as well. These absorb much of the light that travels between distant galaxies and us, and the absorption lines this creates can tell us of lot about the kinds of elements that are out there. At the same time, studying the absorption lines produced by light passing through space can tell us how much light was removed from the original quasar spectrum. Using the Ultraviolet and Visual Echelle Spectrograph (UVES) instrument aboard the VLT, the Swinburne and Cambridge team were able to do just that, thus sneaking a peak at the “fingerprints of the early Universe“. Since it is 8 billion light years away, and its strong intervening metal-absorption-line system, probing the electromagnetic spectrum being put out by HE 0940-1050 central quasar – not to mention the ability to correct for all the light that was absorbed by the intervening intergalactic medium – provided a unique opportunity to precisely measure how this fundamental force can vary over a very long period of time. However, the team corrected for this by comparing the UVES spectra to well-calibrated spectra obtained from the High Accuracy Radial velocity Planet Searcher (HARPS) – which is also located at the at the La Silla Observatory. By combining these readings, they were left with a residual systematic uncertainty of just 0.59 ppm, the lowest margin of error from any spectrographic survey to date. This is exciting news, and for more reasons that one. On the one hand, precise measurements of distant galaxies allow us to test some of the most tricky aspects of our current cosmological models. On the other, determining that electromagnetism behaves in a consistent way over time is a major find, largely because it is responsible for such much of what goes on in our daily lives. But perhaps most importantly of all, understanding how a fundamental force like electromagnetism behaves across time and space is intrinsic to finding out how it – as well as weak and strong nuclear force – unifies with gravity. This too has been a preoccupation of scientists, who are still at a loss when it comes to explaining how the laws governing particles interactions (i.e. quantum theory) unify with explanations of how gravity works (i.e general relativity). By finding measurements of how these forces operate that are not varying could help in creating a working Grand Unifying Theory (GUT). One step closer to truly understanding how the Universe works! Today we’re going to have the most surreal conversation. I’m going to struggle to explain it, and you’re going to struggle to understand it. And only Stephen Hawking is going to really, truly, understand what’s actually going on. But that’s fine, I’m sure he appreciates our feeble attempts to wrap our brains around this mind bending concept. All right? Let’s get to it. Black holes again. But this time, we’re going to figure out their temperature. The very idea that a black hole could have a temperature strains the imagination. I mean, how can something that absorbs all the matter and energy that falls into it have a temperature? When you feel the warmth of a toasty fireplace, you’re really feeling the infrared photons radiating from the fire and surrounding metal or stone. And black holes absorb all the energy falling into them. There is absolutely no infrared radiation coming from a black hole. No gamma radiation, no radio waves. Nothing gets out. Now, supermassive black holes can shine with the energy of billions of stars, when they become quasars. When they’re actively feeding on stars and clouds of gas and dust. This material piles up into an accretion disk around the black hole with such density that it acts like the core of a star, undergoing nuclear fusion. But that’s not the kind of temperature we’re talking about. We’re talking about the temperature of the black hole’s event horizon, when it’s not absorbing any material at all. The temperature of black holes is connected to this whole concept of Hawking Radiation. The idea that over vast periods of time, black holes will generate virtual particles right at the edge of their event horizons. The most common kind of particles are photons, aka light, aka heat. Normally these virtual particles are able to recombine and disappear in a puff of annihilation as quickly as they appear. But when a pair of these virtual particles appear right at the event horizon, one half of the pair drops into the black hole, while the other is free to escape into the Universe. From your perspective as an outside observer, you see these particles escaping from the black hole. You see photons, and therefore, you can measure the temperature of the black hole. The temperature of the black hole is inversely proportional to the mass of the black hole and the size of the event horizon. Think of it this way. Imagine the curved surface of a black hole’s event horizon. There are many paths that a photon could try to take to get away from the event horizon, and the vast majority of those are paths that take it back down into the black hole’s gravity well. But for a few rare paths, when the photon is traveling perfectly perpendicular to the event horizon, then the photon has a chance to escape. The larger the event horizon, the less paths there are that a photon could take. Since energy is being released into the Universe at the black hole’s event horizon, but energy can neither be created or destroyed, the black hole itself provides the mass that supplies the energy to release these photons. The most massive black holes in the Universe, the supermassive black holes with millions of times the math of the Sun will have a temperature of 1.4 x 10^-14 Kelvin. That’s low. Almost absolute zero, but not quite. A solar mass black hole might have a temperature of only .0.00000006 Kelvin. We’re getting warmer. Since these temperatures are much lower than the background temperature of the Universe – about 2.7 Kelvin, all the existing black holes will have an overall gain of mass. They’re absorbing energy from the Cosmic Background Radiation faster than they’re evaporating, and will for an incomprehensible amount of time into the future. Until the background temperature of the Universe goes below the temperature of these black holes, they won’t even start evaporating. A black hole with the mass of the Earth is still too cold. Only a black hole with about the mass of the Moon is warm enough to be evaporating faster than it’s absorbing energy from the Universe. As they get less massive, they get even hotter. A black hole with the mass of the asteroid Ceres would be 122 Kelvin. Still freezing, but getting warmer. A black hole with half the mass of Vesta would blaze at more than 1,200 Kelvin. Now we’re cooking! When black holes have lost most of their mass, they release the final material in a tremendous blast of energy, which should be visible to our telescopes. Some astronomers are actively searching the night sky for blasts from black holes which were formed shortly after the Big Bang, when the Universe was hot and dense enough that black holes could just form. It took them billions of years of evaporation to get to the point that they’re starting to explode now. This is just conjecture, though, no explosions have ever been linked to primordial black holes so far. It’s pretty crazy to think that an object that absorbs all energy that falls into it can also emit energy. Well, that’s the Universe for you. Thanks for helping us figure it out Dr. Hawking. The merger of the Milky Way and Andromeda galaxy won’t happen for another 4 billion years, but the recent discovery of a massive halo of hot gas around Andromeda may mean our galaxies are already touching. University of Notre Dame astrophysicist Nicholas Lehner led a team of scientists using the Hubble Space Telescope to identify an enormous halo of hot, ionized gas at least 2 million light years in diameter surrounding the galaxy. The Andromeda Galaxy is the largest member of a ragtag collection of some 54 galaxies, including the Milky Way, called the Local Group. With a trillion stars — twice as many as the Milky Way — it shines 25% brighter and can easily be seen with the naked eye from suburban and rural skies. Think about this for a moment. If the halo extends at least a million light years in our direction, our two galaxies are MUCH closer to touching that previously thought. Granted, we’re only talking halo interactions at first, but the two may be mingling molecules even now if our galaxy is similarly cocooned. Lehner describes halos as the “gaseous atmospheres of galaxies”. Despite its enormous size, Andromeda’s nimbus is virtually invisible. To find and study the halo, the team sought out quasars, distant star-like objects that radiate tremendous amounts of energy as matter funnels into the supermassive black holes in their cores. The brightest quasar, 3C273 in Virgo, can be seen in a 6-inch telescope! Their brilliant, pinpoint nature make them perfect probes. Astronomers have observed halos around 44 other galaxies but never one as massive as Andromeda where so many quasars are available to clearly define its extent. The previous 44 were all extremely distant galaxies, with only a single quasar or data point to determine halo size and structure. Andromeda’s close and huge with lots of quasars peppering its periphery. The team drew from about five years’ worth of observations of archived Hubble data to find many of the 18 objects needed for a good sample. The halo is estimated to contain half the mass of the stars in the Andromeda galaxy itself, in the form of a hot, diffuse gas. Simulations suggest that it formed at the same time as the rest of the galaxy. Although mostly composed of ionized hydrogen — naked protons and electrons — Andromeda’s aura is also rich in heavier elements, probably supplied by supernovae. They erupt within the visible galaxy and violently blow good stuff like iron, silicon, oxygen and other familiar elements far into space. Over Andromeda’s lifetime, nearly half of all the heavy elements made by its stars have been expelled far beyond the galaxy’s 200,000-light-year-diameter stellar disk. You might wonder if galactic halos might account for some or much of the still-mysterious dark matter. Probably not. While dark matter still makes up the bulk of the solid material in the universe, astronomers have been trying to account for the lack of visible matter in galaxies as well. Halos now seem a likely contributor. The next clear night you look up to spy Andromeda, know this: It’s closer than you think! For more on the topic, here are links to Lehner’s paper in the Astrophysical Journal and the Hubble release. Could the Milky Way Become a Quasar? There’s a supermassive black hole in the center of our Milky Way galaxy. Could this black hole become a Quasar? Previously, we answered the question, “What is a Quasar”. If you haven’t watched that one yet, you might want to pause this video and click here. … or you could bravely plow on ahead because you already know or because clicking is hard. Should you fall in the latter category. I’m here to reward your laziness. A quasar is what you get when a supermassive black hole is actively feeding on material at the core of a galaxy. The region around the black hole gets really hot and blasts out radiation that we can see billions of light-years away. 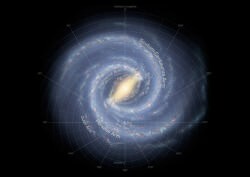 Our Milky Way is a galaxy, it has a supermassive black hole at the core. Could this black hole feed on material and become a quasar? Quasars are actually very rare events in the life of a galaxy, and they seem to happen early on in a galaxy’s evolution, when it’s young and filled with gas. Normally material in the galactic disk orbits well away from the the supermassive black hole, and it’s starved for material. The occasional gas cloud or stray star gets too close, is torn apart, and we see a brief flash as it’s consumed. But you don’t get a quasar when a black hole is snacking on stars. You need a tremendous amount of material to pile up, so it’s chokes on all the gas, dust, planets and stars. An accretion disk grows; a swirling maelstrom of material bigger than our Solar System that’s as hot as a star. This disk creates the bright quasar, not the black hole itself. Quasars might only happen once in the lifetime of a galaxy. And if it does occur, it only lasts for a few million years, while the black hole works through all the backed up material, like water swirling around a drain. Once the black hole has finished its “stuff buffet”, the accretion disk disappears, and the light from the quasar shuts off. Sounds scary. According to New York University research scientist Gabe Perez-Giz, even though a quasar might be emitting more than 100 trillion times as much energy as the Sun, we’re far enough away from the core of the Milky Way that we would receive very little of it – like, one hundredth of a percent of the intensity we get from the Sun. Since the Milky Way is already a middle aged galaxy, its quasaring days are probably long over. However, there’s an upcoming event that might cause it to flare up again. In about 4 billion years, Andromeda is going to cuddle with the Milky Way, disrupting the cores of both galaxies. During this colossal event, the supermassive black holes in our two galaxies will interact, messing with the orbits of stars, planets, gas and dust. Some will be thrown out into space, while others will be torn apart and fed to the black holes. And if enough material piles up, maybe our Milky Way will become a quasar after all. Which as I just mentioned, will be totally harmless to us. The galactic collision? Well that’s another story. It’s likely our Milky Way already was a quasar, billions of years ago. And it might become one again billions of years from now. And that’s interesting enough that I think we should stick around and watch it happen. How do you feel about the prospects for our Milky Way becoming a quasar? Are you a little nervous by an event that won’t happen for another 4 billion years? Thanks for watching! Never miss an episode by clicking subscribe. Our Patreon community is the reason these shows happen. We’d like to thank Damon Reith and Jay Allbright, and the rest of the members who support us in making great space and astronomy content. Members get advance access to episodes, extras, contests, and other shenanigans with Jay, myself and the rest of the team. Want to get in on the action? Click here.